Grapes are a popular snack because of their unique taste, texture, and tart flavor. They are a refreshing addition to vegetable and fruit salads. Grapes are oval-shaped berries with semi-translucent flesh and a smooth skin. Some grapes have edible seeds while some are seedless. Grapes have a protective bloom, which is whitish in color. But there are concerns with grapes and some wonder if consuming grapes would cause any harm to the body. Read on and find the answers. Red seedless grapes are rich in fiber, which keeps your bowels healthy and prevents constipation. A cup of grapes or 30 grapes contain 1.5 grams of fiber. Your body requires 28 grams of fiber to digest a diet with 2,000 calories. Hence, a serving of grapes provide 5% of the daily fiber requirement. Green grapes are rich in vitamins K and C. Vitamin C prevents infections and promotes the health of blood vessels, bones, gums, and teeth. Seedless red grapes contain additional antioxidants including beta-carotene, vitamin E, vitamin A, zeaxanthin and lutein. Antioxidants protect the body from the effects of free radicals. These compounds increase the risk of chronic diseases including cancer. A cup of green grapes has 4.8 milligrams of vitamin C. The body requires 75-90 milligrams of the vitamin every day. Vitamin K promotes the health of bones and blood clotting. One cup of green grapes contains 22 micrograms of the daily requirement of 120 micrograms of vitamin K.
Green seedless grapes are good sources of iron and potassium. The body requires 4,700 milligrams of potassium, which promotes muscle, cell, tissues, organ, and heart functions. A cup of green grapes provides 288 milligrams of potassium. Iron promotes formation of red blood cells and oxygen flow in the body. Men require 8 milligrams of iron daily while women require 18 milligrams. A cup of green seedless grapes has 0.54 milligrams of iron. Grapes contain polyphenols, which lowers the risk of heart disease. They also promote the heart’s health by helping the blood vessels relax, which in turn promotes blood flow. Here is another answer to the question, are grapes bad for you? Eating grapes enables you to keep the energy density in your foods low. You need to eat large amount of foods with low calories to lose weight. Flavonoid-packed fruits such as grapes help you maintain a healthy weight and even loose excess weight. Eating grapes regularly promotes eye health by preventing the deterioration of the retina. A diet rich in grapes protects the retina’s structure and function. Eating grapes does not increase your insulin and blood sugar levels significantly. High insulin levels lead to insulin resistance. 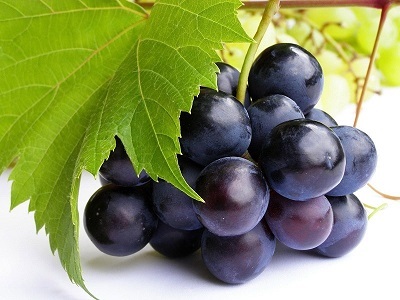 Eating foods that do not increase insulin significantly like grapes prevents insulin resistance, which is a major characteristic of type 2 diabetes. Grapes help in maintaining a healthy colon by inhibiting the genes that cause tumor growth in the colon. A cup of grapes provides only 100 calories. However, you can lose track easily of the number of grapes you have eaten. You can easily double or even triple the 100 calories. Eating grapes regularly without control will lead to weight gain. Put a limited number of grapes in a bowl when eating them as snacks. Carbohydrates are converted into glucose. Your diet should include carbohydrate but the carbohydrates should provide 45-60% of your calories intake. Over consumption of grapes will increase your carbohydrate intake, which leads to carbohydrate overload. Eating raisins, sultanas, and dried grapes in large quantities leads to ingestion. Overeating grapes may also cause diarrhea. Individuals that have fructose intolerance may experience indigestion with abdominal pain. Such individuals should avoid eating grapes because they may interfere with their liver and kidney functions. Over consumption of grapes may cause fructose malabsorption. The body releases fructose in large amounts as it digests grapes. The digestive tract breaks down part of the fructose but part of it is passed to the gut in its undigested form. The colon bacteria feed on the undigested fructose and release gas, which leads to flatulence and bloating. Another side effect to consider when addressing the question, “are grapes bad for you” is their effect on the gut. One cup of grapes provides 15 grams of fiber, which may not disrupt your gut function. However, eating fiber-rich grapes in large quantities will lead to stomach discomfort because your body is unused to large quantities of fiber. Passing stools may be difficult, which is one of the constipation signs or diarrhea as your body releases excess fiber. How Much Cholesterol Should I Eat? How Much Chia Seeds Per Day?